Ok so, yes. its true. I havent updated this blog in 2 months. BUT WHY ANGIE WHY! because friends, I got a new job in a kitchen. I eat, i sleep, i cook. I also you know lurk around on facebook so...BLAME FACEBOOK AND ALL ITS GLORY! But I have a day off, first in a week and I am using some of that time to get a blog entry in. Ha-haa. 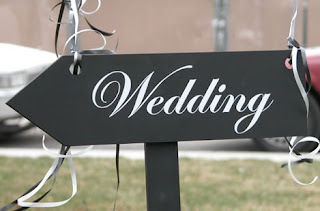 So today i thought since many people i dont get to see or talk to as much as i like have been asking me about the wedding, I will do a wedding entry. Now a few blogs back i introduced my bridal party and wrote a little poem. That was part of something i do by monthly called "The Bridesmaid News" which is just me talking about random wedding stuff and updating the ladies. I didn't however post the whole thing cause it was 8 pages long. So today you get an edited down version of the second edition! Welcome to the 2nd Official Edition of the Bridesmaid Newsletter! I’m sitting comfortably on the couch feeling bridal and giddy! I’m watching Grey’s Anatomy and my 2 very favourite characters have just been proposed to at the same time! So thus par, I am very in the mood to start today’s edition! This week marks the ONE YEAR count down to the wedding! Which means that the wedding has moved from “Next Year” status to “UNDER A YEAR” status! Matt and I are PUMPED and can’t imagine what we are going to do to make this year pass both swiftly and comfortably! But considering how well paced this last 6 months went I think that wish just may come true! So what have we been up to? Well not oodles and oodles of full on bridal planning…yet. But things are going steady and smoothly and I’m enjoying the ride. We officially booked with our DJ last week! We went with Flashpoint DJ’s. I met them at the Bridal Show and won free bubbles! But when I got in contact with them they traded me the 50 dollar bubbles for 150 dollars off the total package. They sent me this 10 page survey where they ask all about us and where we work, what we listen to, how we met, if any parents will not be at the wedding and why. Then they list off like 300 songs and they want you to pick what you like, what your friends like, how many people of what age group there are, did we pick music for everyone or just our own tastes. WHEW! And that’s like half the questions. But it’s been interesting trying to agree on certain songs… *Cough* Hot in Herre *Cough*. The DJ has also asked us to select an MC from the people we know to ensure proper name pronouncement and to give the night a more personal touch. So the MC for the wedding will be SHANE Wooo! Shane is also a member of the wedding party and one of our dearest friends. (Well you’re all our dearest friends that’s why you’re in the wedding!) Shane is an Actor, currently in school at York U! He keeps me so entertained and he’s just awesome! We didn’t think twice about whom to ask to do us this honour! As far as selecting people goes we haven’t a clue what we are doing for our ceremony. We don’t know if we’re writing our own vows, how we want to go about music (family or church guy or regular pre recorded wedding jive). But what we did decide was to ask our friend Tom to read the first passage for us! Tom moved away to BC on us and we wanted to be able to include him in the day. Naturally he was very touched and accepted! It just wouldn’t be the same without our good old Tommy Thompkins. In the interest of being able to party all night at the wedding and not having to rush away we are starting our honeymoon on the Monday, June 9th, and are leaving for NEW YORK CITY! We’ll be in the big apple for 5 days and are boarding the Caribbean Princess Cruise Ship on Friday June 13th. Am I feeling superstitious about the cruise leaving on the 13th? Nope! We’ll be taking this lovely boat with our balcony room (breakfast on the ocean, oh yes) through the Caribbean and around the Bermuda triangle. AHH! 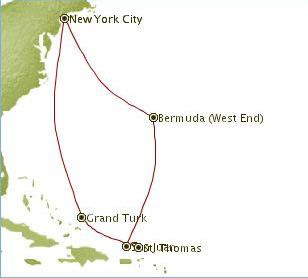 We’ll be visiting The West end of Bermuda, San Juan Puerto Rico, St. Thomas and The Grand Turks! I’ve only been to St. Thomas and our boat is the same boat I was on last time. This will be Matt’s first cruise and I’m so happy to get to be the person he goes on his first one with! I tell him tales of food unending, movies under the stars, falling asleep to the sound of waves, and OH how much fun we will have! This will be our first vacation outside of Ontario together! New York will be amazing! It’s not possible that it not be anything but spectacular when you’ve waited as long or tried as hard to get there as I have! The anticipation is giving me heartburn I think! We’ve agreed to see 2 Broadway musicals, the museum, a nighttime boat tour of the islands, and to get a mile high corn beef on rye from the Carnegie Deli. But nothing is getting booked for a least another 6 months! We have had some wonderful luck with our hotel. Since we are booking through our Cruise line instead of by ourselves we are getting a 4 star Sheraton Towers King Room for 300 dollars LESS than the usual nightly rate. Naturally we really appreciate that perk, as it made a huge difference in the location and star rating we could originally afford. Being that it’s our Honeymoon I have agreed to do certain excursions I would NEVER agree to do for anyone else. I, Angie the woman who can’t so much as put a toe in ocean water (but loves cruising go figure) ….is getting into a submarine…and delving over 80 feet into the ocean. OH…MY…GOD! But I’m actually feeling pretty excited and thinking HEY WHY NOT! The brochure even said they give you a special paper that commemorates the occasion! We’ll only be in St. Thomas together once why not make it interesting. This is what I traded Matt to get out of SCUBA DIVING! It seems like a pretty good switch! in Bermuda we’re taking a ferry tour and hiking through some cool old caves. This is also a Matt chosen adventure. What can I say he’s a Cave Man. Hee! We also will stop in at an aquarium and see what the crazy fish are up to! San Juan looks like the place to shop for great coffee and take a small walk on the beach. I’ll be happy to have a nice shopping day! Mind you…New York will be the main focus of that project. And Finally Grand Turks. This is the Cruise Excursion we’re the most excited about! We’re taking a Dune Buggy tour around the island beaches, through caves, and stopping on a beach for a Lunch and sun session. Matt and I will have our own Dune Buggy and will convoy with several other buggies through places you can’t really go by car! Though I should mention that all of these excursions aren’t listed for next June just this summer so we’re just hoping they will still be running when it’s our turn! It’s going to be such a wonderful end to the long year of planning and excitement, and an amazing start to a wonderful marriage! Whew did I ever talk a lot today! I should have left something to talk about in the next one! I guess that means I just have to do a little more planning! Thanks for reading! I leave you now with the photo of the day! Tune in for the next bridal newsletter. Same Bride time, same Bride Channel!